To me a big part of why I capture photographic images in the first place is to preserve memories that are important to me. By definition, if I intentionally pressed the shutter release button on the camera then the photo I captured is important to me in some way. Therefore, I want to make sure that my photos are stored in a way that minimizes the risk of loss. Hard drives fail—all too often—and I want to ensure that a hard drive failure or other problem that leads to a loss of data is not a particularly stressful experience. To that end, presented in this two-part series are nine habits I consider to be an important part of a strategy for backing up your photos. Backing up your photos (and other important data) is obviously aimed at helping ensure you don’t lose your photos in the event of a hard drive failure, accidental deletion, or some other problem. But if you experience a hard drive failure and your most recent backup was one week ago, all of the new photos and data you’ve created in the past week may be gone forever. Therefore, backing up on a frequent schedule can be critically important. Of course, in this context “frequent” is a relative term. If you haven’t captured any new photographic images or otherwise created any new data since your last backup, there isn’t really a need to update that backup. The way I often explain the notion of how often you should perform a backup is to ask how much data you’re willing to lose in the event of a hard drive failure. Personally, I’d rather not lose a single image, even if that image is under-exposed and a bit out of focus. In other words, I want to backup very frequently to ensure I am minimizing the amount of data I might lose as a result of a hard drive failure. When it comes to what I might consider a “normal” level of risk, about the only time I don’t have a backup copy of my photos is before I’ve downloaded new photos from my digital media cards to my hard drive storage. During the process of downloading photos from my cards I’m creating a second copy, with one copy on my hard drive and another copy on the media card. And, in fact, I’m also creating a third copy as part of that process. The result is that once I’ve downloaded new photos from a media card I have both a primary copy on my main hard drive and a backup copy on a second hard drive, so I can feel pretty confident about formatting the media card in the camera so the card can be used again. I also try to make a point of performing a backup every night if I’ve done any work with my images during the day. And if I’m working on a particularly important project, I’ll even perform a backup during the day at various stages of work. The point is to make sure you’re in the habit of backing up on a regular basis, to ensure you are minimizing the consequences of a hard drive failure or other cause of data loss. When it comes to backup frequency, one way to really ensure frequent backups is to use a real-time solution. For example, you could configure your computer to make use of RAID (Redundant Array of Independent Drives). There are many different “flavors” of RAID, but most implementations enable you to have a real-time backup, by virtue of all data being written to two hard drives at the same time. So, for example, with an appropriate RAID implementation is configured, you might only see a single hard drive within your computer operating system, even though two drives are physically installed. However, the RAID setup will cause any files you save on the first drive to be automatically written to the second drive at the same time. While a redundancy solution such as the various options made possible through RAID can be very helpful, it is also important to be aware of some of the limitations of a RAID system. For example, if files are automatically being written to two hard drives at the same time, that also means that any files you delete will be removed from both hard drives at the same time. In this way your backup solution can also duplicate your errors, potentially making it impossible to recover a photo that had been accidentally deleted. 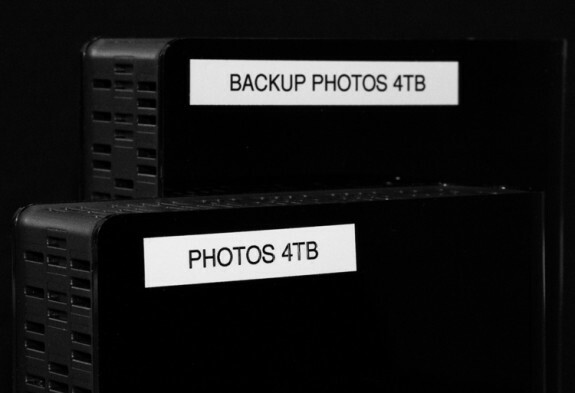 Maintaining an additional backup copy of your photos in addition to a RAID configuration can help mitigate this risk. In addition, with a RAID configuration the two hard drives will generally be in the same physical location, often within the same computer. That means that both are susceptible to the same risk of physical damage. So, for example, if your computer is severely damaged by exposure to water, both RAID hard drives (and thus both copies of your data) may be damaged to the point that data is lost. Again, maintaining a separate backup can mitigate this risk. It may seem entirely obvious, but it is important that the backup copy of your photos be stored separately from the original copies of those photos. I’m surprised how often a photographer tells me that they backup their photos into a separate folder on the same hard drive that the original photos are stored on. When all copies (original and backup) are stored on the same storage device, a failure of that storage device may cause you to lose all copies of your photos. It is important that the backup copies of your photos and other data be stored on a separate storage location from the original copies of your files. It is important to keep in mind that just because it looks like you have two (or more) hard drives on your computer doesn’t mean you actually have more than one physical device. It is possible to configure a hard drive to include multiple partitions, and each of those partitions will appear as an individual hard drive within your operating system, even though all of the partitions are on a single drive. A catastrophic failure of the hard drive could cause all partitions (and therefore all data) to be lost. Taking this concept a step further, it is important that you not only keep the original and backup copies of your photos on separate hard drives, but that those drives not be permanently connected to the same computer. For example, if you have two internal hard drives and you are using one of those as primary storage and one for your backup, there is the risk that a catastrophic issue with the computer will cause the loss of both hard drives. My personal preference is to use external hard drives for my primary and backup storage for photos and other data. When I’m actively working with my photos, I will have the external hard drive containing my photos connected to the computer. I only connect the backup hard drive to the computer when I am actually updating the backup of my photos. At all other times the backup drive is disconnected from the computer. Going a step further beyond making sure that both your primary and backup storage are on separate hard drives is to keep the backup hard drive at a separate physical location from the hard drive used for primary storage. This “offsite storage” approach can mean a variety of things, depending on what options are available to you. Some photographers simply keep their primary and backup storage in separate parts of their house, figuring the risk is relatively low that both drives stored in separate parts of the house will be catastrophically damaged at the same time. If you have a photo studio you could keep one copy of your photos at the studio and another copy at home. You could even keep your backup storage at the home of a friend or family member. The idea is that you can help reduce the risk of data loss by keeping the backup copies of your photos in a separate physical location from the primary copies of your photos. Another option for offsite backup storage is to use a “cloud” backup service, which enables you to have your photos stored on the servers of a cloud provider. That generally means your photos will be further backed up with redundant systems managed by the cloud storage provider. While cloud storage does provide a built-in offsite storage option, I don’t consider it a perfect solution. To begin with, depending on your Internet connection it can require considerable time to copy even a portion of your photo library to a cloud-based storage provider. Also, because this approach means you are depending on a third party to keep your data safe, I recommend using cloud storage as an extra backup solution that goes above and beyond your existing backup workflow. This approach has the added benefit of mitigating the issue of slow transfer speeds, because you can simply use cloud-based storage to backup only your most important photos. The conclusion of this article will appear on April 14, 2015 and will cover Variability, Redundant Redundancy, Copying Techniques and Extended Retention.